Loretta is back today with her third post for The University Project! In my last post I mentioned that I was going through somewhat of a planner fail as my first week of second year was just coming to an end and I was rather swamped with work. This past week I have done an over haul of a lot of my university life and I am sure you will all be pleased to know that I am feeling much more settled. One of the first changes that I made this week is not actually planner related, but I am sure you lovely readers won’t mind! I was so excited about moving out of halls and into a house because this meant that I could actually get a pet! For most people this isn’t such a big deal but I have grown up in a house where at one point we had a grand total of 18 different pets! 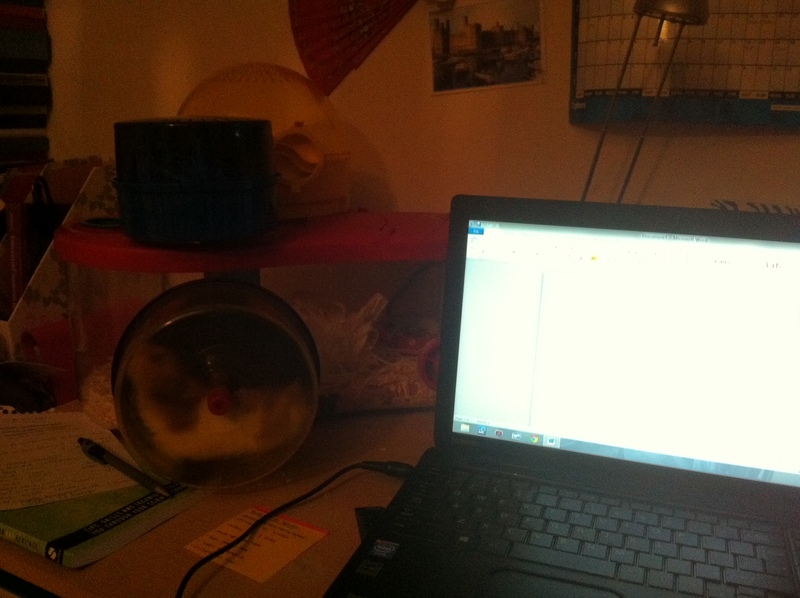 So during the summer I bought a hamster, however since moving to university she has been frequently waking me up at night chewing at the bars on her cage! This week I invested in a rotastak cage which has no bars! The cage’s design meant that it didn’t fit on my bookcase and so it is now on my desk next to my computer. This means when I am up late finishing off my work, I have a friendly face running next to me and this has cheered me up no end and made getting the work done a lot easier! 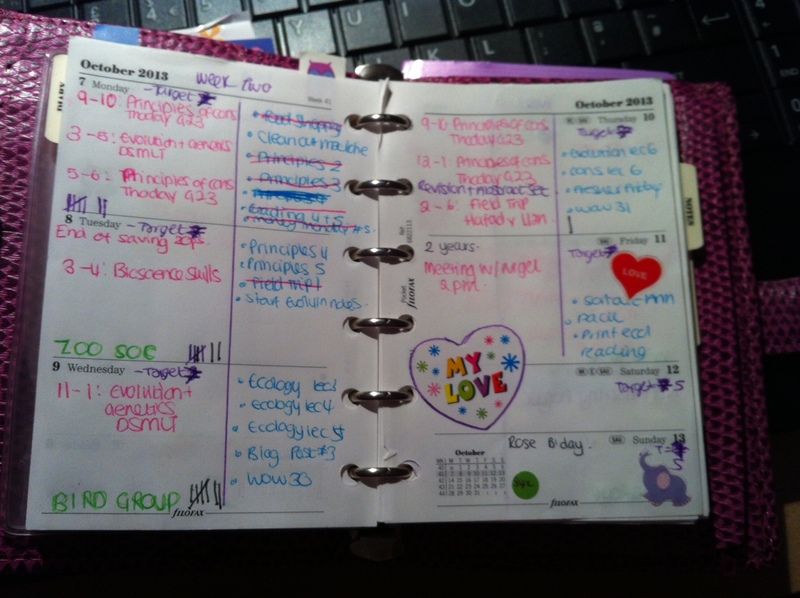 Anyway onto the planner related stuff! The weight of the A5 was beginning to become quite substantial and so I found that I was being lazy (especially if faced with a 6 hour stretch of lectures) and leaving it on my desk. This resulted in me missing my planner whenever a lecture mentioned a deadline or other significant event, so ladies and gentleman, I am now using a two planner system. Over the summer I was using a Raspberry Pocket Chameleon which I have now brought out of retirement and I am using as my handbag planner. This is allowing me to decorate my pages a bit more which is something that I was missing from my A5 planner as I just did not have the space to do so. On my daily pages I write down what lectures I have on one side and things from my master to do list (which is kept in my A5). I have currently only been using this set up for a few days but it is working really well and it is helping to me keep track of my deadlines, which are accumulating rather quickly! The fact that I am now using my A5 as a desk planner means that I can keep the initial set up that I had without having to take any of the sections out in an attempt to reduce the weight of the thing. Currently I have a master to do list in the back and I use a post it note each day detailing things that I need to try and get done that day and I don’t have to worry about the post it note falling out as I rush between lectures! I really like having the pocket size as my secondary planner as it is big enough to keep a record of what I want to in there such as lectures and deadlines but it is not so big that it means that I start to neglect my bigger planner which I still very much love. I am also making a conscious effort to try and drink more water as despite it being very wintery weather outside, our lecture halls are still ridiculously hot and I am finding that I become very tired so I keep a tally in my pocket Filofax of how much water I have had that day. I am currently working on designing more of my own inserts for my A5 and I will hopefully be able to show you those in my next post! And for those of you wondering, I did get a Taylor Swift ticket so I shall be making a countdown insert for that! !